The other day during a particularly busy period at work I embarked on a best of Wilco playlist and found that every track bar one off their most recent offering had to feature. Except for the 15 minutes of amp hummmmm on track 11 this is a perfect album. The reader may have just taken a sharp intake of breath at that controversial word perfect that I just threw in there but I dont care, I stand by that word. When I first encountered Wilco they were way out in front on the ever-expanding alt-country scene and were making simple yet great songs. This style seemed to be changing with the release of 2002s Yankee Hotel Foxtrot and now with A Ghost Is Born Jeff Tweedy has taken his band into the realms of experimental rock genius. Largely due to the production, courtesy of the mighty Jim ORourke, this record sees Wilco turn a very important and difficult corner. From the outset you can see that the agenda has changed here. At Least Thats What You Said is one of the greatest and bravest ways to open an album, its soft bitter-sweet vocal intro turns in to 4 minute crunching guitar solo that leaves you breathless and exhausted and the album has only just begun. 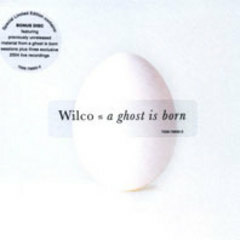 And if, during Hell Is Chrome, you found yourself relaxing into comfortable Wilco territory Spiders(Kidsmoke) soon jolts you to your feet throwing the alt-country rule book so far out the window you wonder if they ever read it, let alone wrote it. Clocking in at over 10 minutes and with a fantastic electronic beat for a backbone this song sounds more like early Roxy Music than our beloved Wilco with its occasional vocals and screeching, stabbing and totally freeform guitar solos. Then youve got Muzzle of Bees, Hummingbird, Handshake Drugs, the list goes on and on and the standard set in the first track is upheld right up to the very last note.